Being a Flight Nurse requires autonomy. In the back of an aircraft, critical thinking skills, quick decision making, and compassion are the essentials of the job. But what happens when the roles reverse, and the Flight Nurse becomes the patient? If you ask Victoria Kretche-Kitchel, a Flight Nurse for Eagle Air Med in Alamosa, Colorado, she’ll tell you that it is a bizarre feeling. Victoria’s journey from nurse to patient started at the race track. She and her husband were working as volunteers at the Shaddy Burro with the Rocky Mountain Enduro Circuit, a long-distance dirt bike race for experienced riders. The day before the race was underway, Victoria was heading from one part of the course to another when things took a turn. When Victoria hit the culvert, she was thrown over the handlebars and landed hard on her back. “I landed with a thud that knocked the wind out of me,” said Victoria. After taking a few minutes to rest and catch her breath, she climbed back on her bike and rode 15 miles back to her campsite. When she got there, she began to feel very stiff and sore. Doubled-over on the side of the road, vomiting from the pain, Victoria waited for paramedics to arrive. And when they did, they immediately took her to Rio Grande Hospital in Del Norte for further examination. There, clinicians found that she had torn her right adrenal gland, had a hematoma that was bleeding into her abdomen, had bruising on one of her kidneys as well as along her ribs and pelvis, and she had broken her second lumbar spine. Being the rough and tumble personality she is, Victoria was shocked that her injuries were as severe as they were and that doctors were now recommending she be flown to the closest Level 1 trauma center for surgery. With time being a critical factor, the medical team at Rio Grande immediately began calling local air medical transport services to request an aircraft. 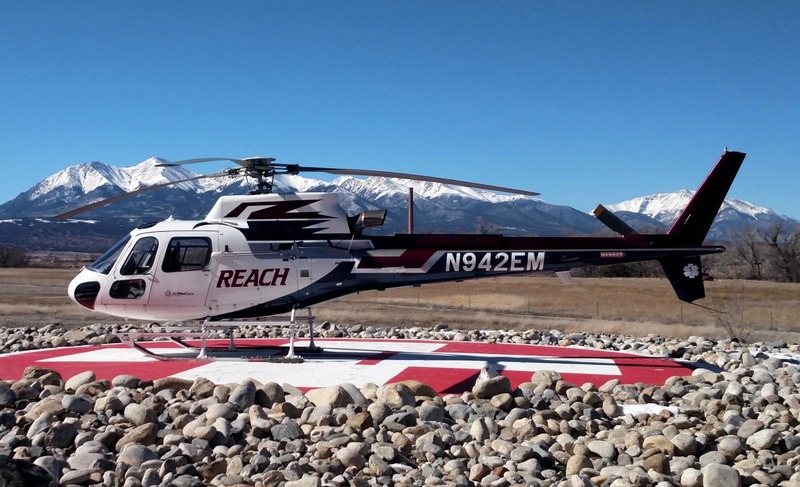 The Airbus H-125 flown by REACH 29 in Buena Vista, Colorado. Victoria was hoping that her colleagues at Eagle Air Med would be available to transport her, but both teams were already encumbered on other flights. 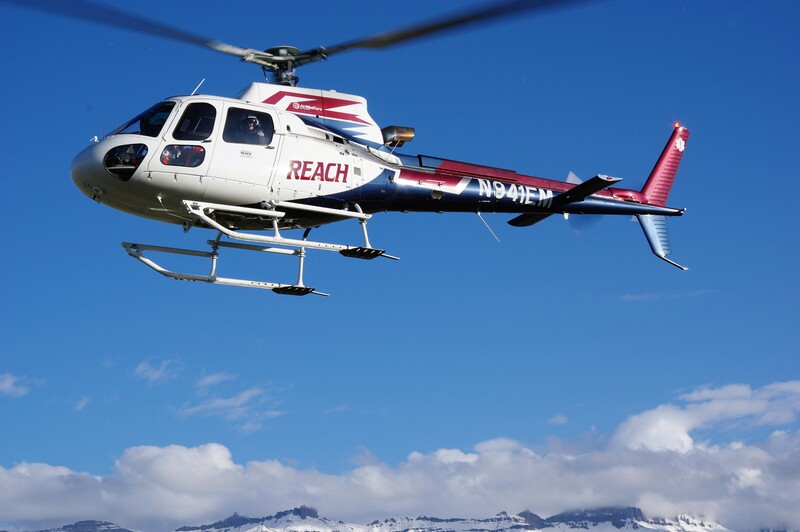 Eagle Air Med and REACH are sister companies, both owned by Air Medical Group Holdings, so Victoria could count on receiving the same excellent patient care from REACH that she would receive from her own team. REACH 29 located in Buena Vista responded to the call that day. On shift was Pilot Elizabeth Peebles, Flight Nurse Peter Bracker, and Flight Paramedic Scott Coduto. “When we got to the hospital, everyone kept telling us ‘oh, you’re taking one of your people, she’s a flight nurse,’” said Peter. Intrigued by this news and ready to get to work, Peter and Scott headed off to meet Victoria and take the report on her condition. After introducing themselves, Scott and Peter set to work preparing Victoria for what she could expect on their flight to Denver. However, being that she was in their same line of work, both Scott and Peter felt that they could communicate more freely with her since their knowledge base was the same. After completing all their assessments and pre-flight preparations, Scott and Peter wheeled Victoria out to the helipad where Elizabeth was waiting with the aircraft. It was shocking to me that our patient was someone that worked for our sister company since it is a small industry." With their introductions out of the way and the aircraft safely loaded, Elizabeth lifted the single-engine Airbus H-125 helicopter and departed for Denver. For the next hour and a half, Peter and Scott paid close attention to Victoria’s vital signs and were prepared to act if her condition began to decline. They also worked diligently to help manage her pain level. In addition to caring for her injuries, Peter and Scott made every effort to help Victoria relax and keep her mind from wandering. Being that she was aware of her condition and how serious it was, this was going to be a bit of a challenge. Covering every topic from work to the air medical industry, to membership, to even sharing the occasional joke, the four passed the time quickly and managed to help Victoria relax enough to also rest at some points during the flight. And soon, Elizabeth was safely touching down on the helipad at St. Anthony’s hospital in Denver. A REACH team in flight. From there, Scott and Peter transferred care of their new friend and colleague to a waiting team of clinicians, many of whom already knew Victoria by name. “The trauma surgeon on-duty happened to be someone that I’ve worked with in the past, so it was great knowing I was in good hands,” said Victoria. Thankfully though, Victoria didn’t end up needing the skills of a surgeon after all. After being transferred to the care of the ICU team at St. Anthony’s she was put on strict bedrest and was closely monitored for three days before she was released to go home. The other piece of good news – the cost of her transport was covered entirely by the AirMedCare Network membership that is given to all Air Medical Group Holding employees. Victoria did receive one piece of bad news though – no sports, no dirt bikes, and no horses for three months. Being that her trauma surgeon knew her personally, this was stern advice that he emphasized she follow. We are happy to report that Victoria is now fully recovered from her accident and is happily back at work helping others with her team at Eagle Air Med.